To be honest, it was the cute designs that got to me first. When I was pregnant with Jaden, we were looking at the option of cloth diapering. Reading about how economical, earth-friendly, and easy it was, I was intrigued. We had come far ahead from the lampins we were in when we were babies - now we have modern cloth nappies (MCNs) in the market. It was something I said I'd try and see how it'd go and take it from there. I didn't want to commit immediately because I wanted to see if it would fit me and bub and I had a few concerns about it mainly on the practicality and convenience. To be honest, what was stopping me was my lack of knowledge/experience about MCNs, and after reading about it and researching online, these issues were laid to rest. Laundry-schedule and dry-pailing was the next thing too, and the search for the nappy pail and nappy pail liners was on to next. Once I had everything and the process sorted out, it became a cinch! 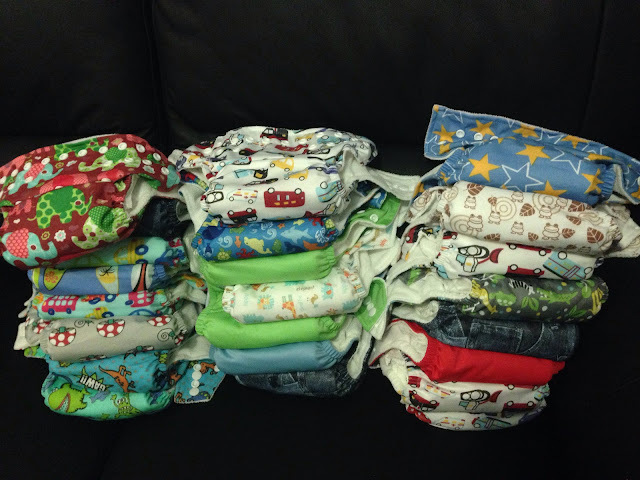 One of the worries I had before starting cloth nappies was whether they'd actually hold it all in with just cloth. But amazingly, with about a couple of months in, I never got any leaks - the leaks I've had were ironically from disposables when nasty "explosions" occur. For overnight, I double up the liners and it's been all good. Another concern was the gross thing with dealing with #2s, which became easy peasy with flushable bamboo liners. just lay on top of the nappy and nick out in the toilet for #2s. The next thing which is always on debate - the cost. With cloth nappies, there's an upfront cost as you build your nappy stash where the recommended number of nappies you should have is around 24. Plus, factor in your water consumption and detergent. I'm not going to do the calculations here - alot of resources are available online; but in the long run, we figured we could save a bit 'til the bub gets toilet-trained. After trying a few brands and different styles, we decided to stick with HippyBottomUs modern cloth nappies. The products are affordable and one-sized, the adjustable snaps ensures that one nappy can fit a baby in all sizes - from a tiny newborn (or a premie) 'til they become toilet-trained. The shells are PUL-lined, practically waterproof, so leaks are highly unlikely. Made of organic material, I am sure that chemicals and all the nasties don't touch baby's skin, so diaper rashes are avoided. The bamboo material holds odour in too, something I find that disposables don't. And the designs - so many cute designs to choose from that you just want to have them all! If you're interested to give cloth diapering a try, there are lots of resources available online and I highly recommend reading up on it and who knows, you'd come to love it as much as I do.